Home / Preakness 2018 / Preakness Super Screener Now Available! With a heavy favorite in Justify, and Derby runner-up Good Magic back for another shot, how can you cash big on the Preakness this year? 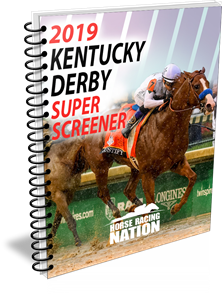 The 2018 Preakness Super Screener has the advice you need to cash big! Based on a 20-year study, the Preakness winning criteria is COMPLETELY DIFFERENT from the Kentucky Derby. It’s a totally different race, and horses need different qualities to hit the board! Find out how and why in the Super Screener! Wagering guide with Exacta, Trifecta and Superfecta tickets! Get your copy Now & get a head start on a big score! Next Story → Preakness 2018 Recap – Justify Tops Tickets – Belmont Stakes Next! Preakness 2018 Recap – Justify Tops Tickets – Belmont Stakes Next!